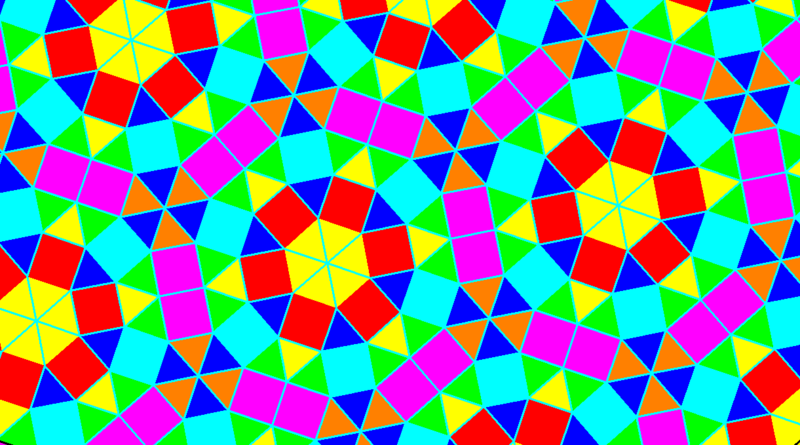 Unlike my previous octagon-tiling discoveries (see previous post), this is a chiral, radial tessellation, with the colors chosen to highlight that fact. In April 2014, I found a tessellation of the plane which uses two kinds of octagons — both types equilateral, but only one type regular. Now, I have found two more ways to tessellate a plane with octagons, and these octagons are also equilateral. 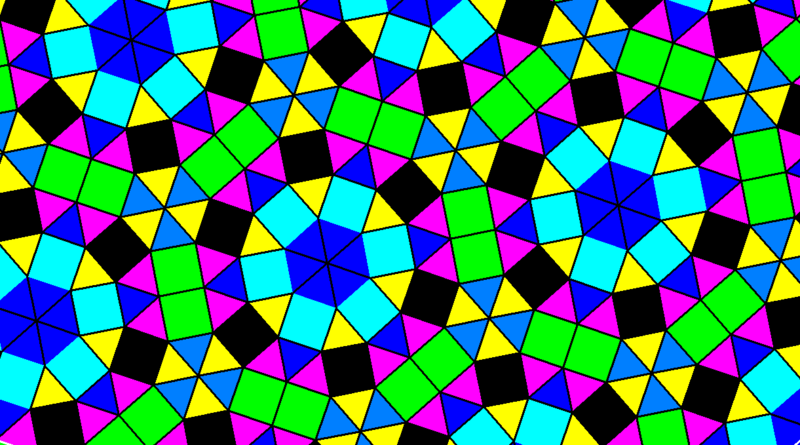 However, in these new tessellations, only one type of octagon is used. One of them appears below, twice (the second time is with reversed colors), and the other one appears, once, in the next post. I have several “lost works” that I’m slowly finding and posting, from old jumpdrives, computers, little-known blogs, etc., and this is one of them. I made it in 2012, but few have seen it before now. 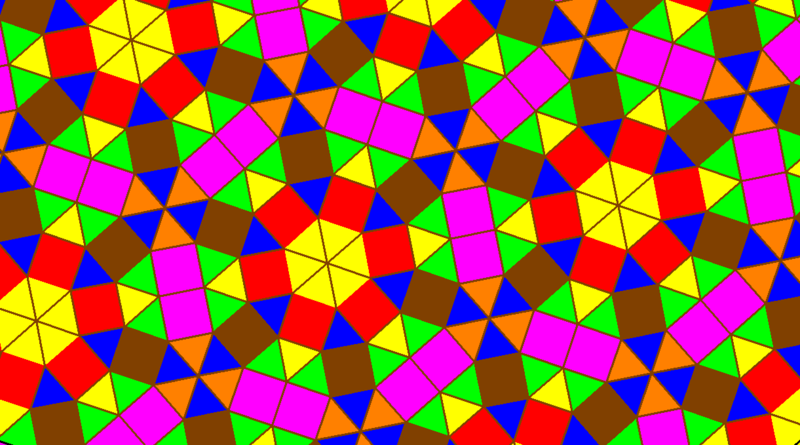 The tessellation of the plane which uses regular convex octagons and squares is well-known. This related tessellation, however, is not. I didn’t know it existed until I stumbled across it . . . although I very much doubt I am the first person to do so. In each case, modifications along hexagon-edges were made using equilateral triangles. 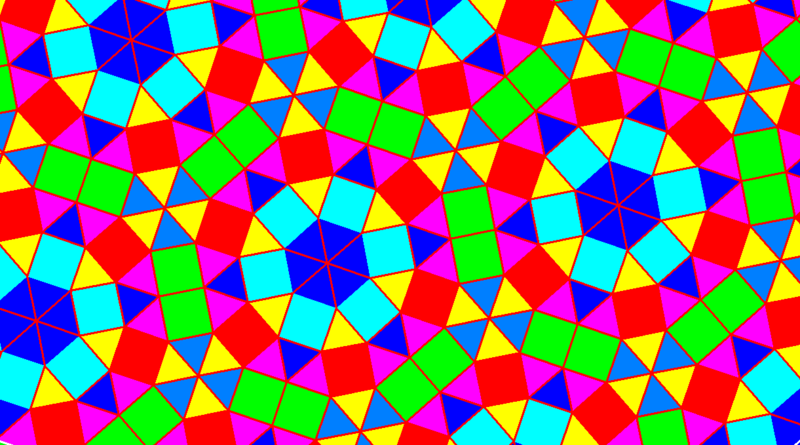 Every segment in this tessellation has equal length, also, which required trisection of the original hexagons’ sides. Regions between close-packed circles of equal radius resemble triangles, but with 60 degree arcs replacing the sides. As these regions are the only things left of a plane after all such circles are sliced out, and they each are outside all the circles used, I’ve decided to name them “circumslices.” Interestingly, the three interior angles of a circumslice each asymptotically approach zero degrees, as one approaches circumslice-vertices, which are also the points of contact of the circles. Why did I name these things “circumslices?” Because they needed a name, that’s why!